I made this dish just because of the previous posted dish 'Sarkkara Upperi'. After making it the plantain skin was left out. Normally whenever I make curry or side dish with plantain banana I use the skin as well by slighly peeling of the edges of the skin. I didn't feel like to throw off the plantain skin, so I gave it a make-over and it resulted to be a yummy side dish in our dining table. So to those who like plantain skin and to those who do not know of it try out this plantain skin stir fry with whole moong. I'm sure you will enjoy the taste of this crunchy and tasty vegetable stir fry. Soak the Moong(Cherupayar) for 10 - 15 mins if possible. Wash and cook the moong covered by adding 1 cup of water and salt(a bit more than half cook is good enough, it should not be sticky). Set aside. Slightly peel the the outer skin of the plantain skin, finely chop it and soak in water for sometime to remove the stain. Wash well two to three times and remove the stain as much as possible. I got one and half cup of chopped and clean plantain skin. Coarse grind(Chathkkuka) coconut and jeera and set aside. Heat up a frying pan, pour oil and crackle mutard seeds. Add curry leaves, whole red chilly and add chopped plantain skin. Stir well for a minute to mix. Add salt, turmeric powder, chilly powder and stir well. Add the cooked whole moong, ground coconut and stir everything well. Check for the salt and spice. Cover and cook it on medium heat for another five to seven minutes till plantain do not have raw smell and it turns out to be crispy. Switch off the flame and serve warm with Rice or Roti. Enjoy!!!! Delicious thoran...very unique combination..:) Loved it though.. 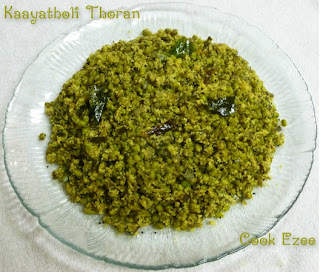 The "followers" widget does not seem to work:( I will try after sometime..
oh my..this is my fave and my mother always make it when im in kerala. in kerala, my dad get the peel them from the shops that make banana chips.the plantains i get here dont taste so good, so i dont try it here.thanks for sending this dish..
@Reva:- Thank you, it is a yummy combination too :) I guess the followers gadget is working ok now, lemme know. 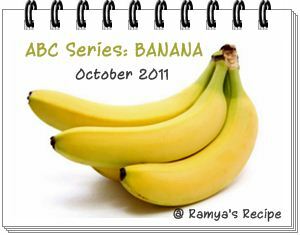 @Ramya:- My favourite too. we get the kerala kinda raw plantain in korean stores. Will try to link few more for the event..
Hi this is new to me.Luvly Banana peel thoran,luks yumm and delicious too.Thanks for sharing and dropping in.